China Painful Economic Rebalancing Act Ahead? 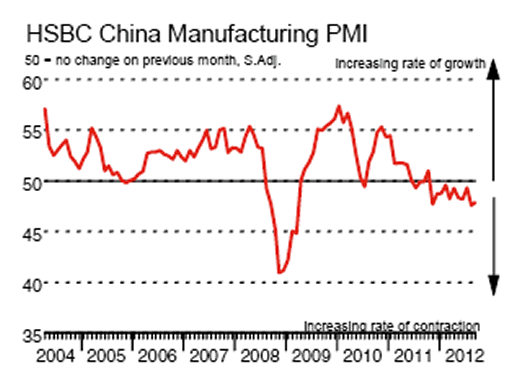 HSBC China Manufacturing PMI™ shows Output falls at fastest pace since March . Data in September signalled a stronger decline in Chinese manufacturing output, as the volume of new orders fell for the eleventh consecutive month. New export orders declined at the sharpest rate in 42 months amid reports of weak international demand, while lower workloads were linked to a fall in backlogs of work. After adjusting for seasonal factors, the HSBC Purchasing Managers' Index™ (PMI™) - a composite indicator designed to give a single-figure snapshot of operating conditions in the manufacturing economy - posted 47.9 in September, up slightly from 47.6 in August, and signalling an eleventh successive month-on-month deterioration in Chinese manufacturing sector operating conditions. However, the latest data signalled the rate of deterioration eased marginally. The rate of reduction in manufacturing output in China accelerated during September, signalling the strongest contraction since March. A number of respondents that reported a fall in production levels attributed this to lower order volumes as both domestic and international demand weakened. However, the rate of reduction in new export orders remained stronger than the decline in overall new orders. Panellists commented on tough trading conditions in a number of key trading markets. Discounting the continually over-optimistic comments from Markit economists in general, I would otherwise be puzzled by comments of Hongbin Qu, Chief Economist, China & Co-Head of Asian Economic Research at HSBC who said: "Chinese manufacturing growth is likely to be bottoming out. However, the sharper contraction of new export orders and the lingering pressures on job markets mean that Beijing should step up easing to support growth and employment. Fiscal measures should play a more important role in the coming months." What indication is there that manufacturing growth is bottoming out? In the first place, China manufacturing is in contraction, not growth. Moreover, the European recession is strengthening and a US recession is underway (just not recognized yet in my opinion). Thus it would be logical to assume China's export-driven economy is going to take another hit. Is Beijing going to step up and support employment and growth? I do not have the answer to that, but China needs to rebalance, and that rebalancing act will be painful. The transition to a consumer-led economy from an export and infrastructure-building economy will be slow and painful, but also very necessary.